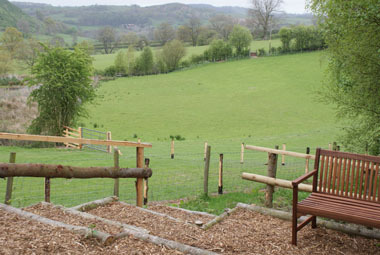 We at Tan y Foel offer caravan holidays in rural Mid Wales together with practical courses and relaxing treatments. Courses are offered for those with an interest with Organic Farming, Permaculture, Ecology, Green Practices and Smallholding. We also have specatular Bird Watching, and relaxing Reiki and Aromatherapy treatments. We are featured in the new Good Retreat Guide. Located in Mid Wales, the farm is set in the most idyllic location on the side of a welsh mountain with spectacular views of both the mountain and the valley. It is a beautiful and peaceful place to relax. We strive to operate our farm according to sound environmental principles. To learn more about our 'Green Credentials' click on the image to the left or here. 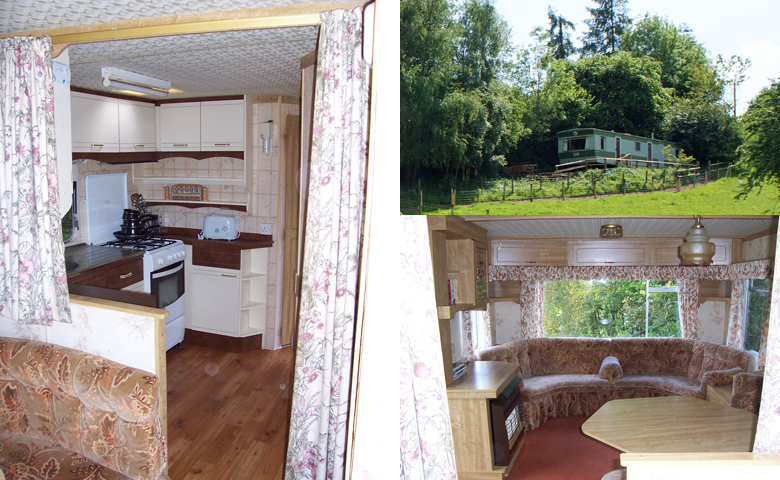 The holiday accommodation is in one of two caravans. 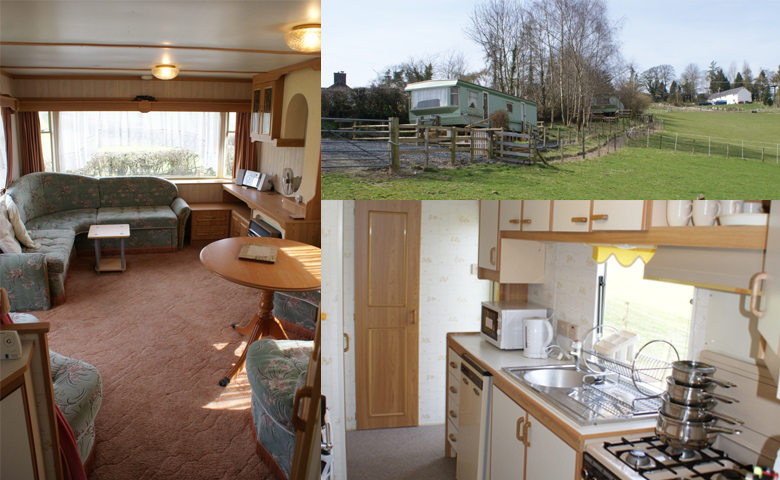 Both caravans are set in their own landscaped enclosure and both have a seating area. This is a perfect place to sit and watch the wildlife, and take in the scenery, or just relax at the end of the day and watch the sun set. 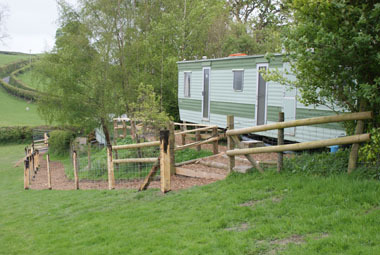 Both caravans overlook lush fields and the wildlife area all framed by the mountain. They have heating in the lounge, and the bathrooms have showers. Duvets pillows and blankets are included and you just need to bring your own sheets pillow cases and towels. All gas and electric are included in the price. The first caravan (Countess) sleeps 4. It is a comfortable and luxurious unit with a large double bedroom and a second bedroom containing two single beds. It has a well equipped kitchen, spacious lounge and a large bathroom. The second caravan (Earl) sleeps six, in one double bedroom, a single bedroom that contains twin single beds and one bunk bed, plus a converting bed in the dining area. Both Countess and Earl have private seating areas with patio furniture. We are in a most enviable position for those who love the countryside, there is a footpath from the farm itself, which takes you to the top of the mountain, and a second path takes a more leisurely, but longer route around it. From here you have endless access to explore the wonderful surrounding countryside which is a haven for birdwatchers and cyclists alike. In addition there are a great many other superb routes for both walkers and cyclists many of which are circular routes. Lake Vyrnwy is an easy drive away and is a great day out for all the family but of especial interest to the energetic cyclist or walker. We are only four miles from the Welshpool and Llanfair light railway. This is a truly superb narrow gauge steam railway. Starting at Llanfair Caereinion the WLLR has a shop and a tea room and the steam train takes a leisurely journey through the spectacular countryside to Welshpool and back, the whole journey taking two hours. Welshpool itself is a traditional market town, still holding a market two days a week. In addition, there is a fascinating selection of small shops. There are also four garden centres within ten miles and the Powys Castle and grounds are situated in Welshpool itself which is a wonderful day out. The Castle is a very special place and well worth a visit. This part of Mid Wales is an explorer's paradise, with endless wonderful villages and attractions together with markets fetes and fairs. Mid Wales is a great place to find out about the wonderful welsh people, language and traditions. A little further afield is the Centre for Alternative Technology (C.A.T) and further afield still is the coast with such wonderful sea side resorts as Aberystwyth with its great shops with its Victorian Cliff Railway and as a starting point for the Vale of Rheidol Railway. On arrival you will find details of all local attractions are available in your accommodation. Why is a Tan Y Foel holiday so special? We aim to provide a superb holiday where you will find the pace of life slower and more relaxed. We aim to provide everything to make your stay enjoyable your accommodation even has a selection of games and books. There is no TV as there is no reception, not a bad thing, as it means that you can concentrate on leaving the stresses and worries of modern day life behind you. We can arrange for a grocery box to be waiting for you on arrival. In addition, we can also arrange for milk to be delivered to you three times a week. Both these items supplied at cost. Your accommodation will include a welcome pack of refreshments so you can put your feet up and unwind the minute you arrive. And don't forget, whilst you are here you can treat yourself to a pampering session in the treatment suite (click on the Therapies Tab). Therapies can be pre-booked ahead of your arrival or you may choose, subject to availability, to book sessions as you require them. © 2012 Tan Y Foel Farm Holidays. Web site by Tilde Enterprises.